The cray? You can't HANDLE the cray! That's right, its vegan parmesan, that tastes and handles just like the real deal. I know. CRAY! I love parmesan, and usually buy an awesome commercial one, but pay through the proverbial for it. Then I found this totally random recipe on a late night interwebs scour, that brought some very controversial ingredients together, which are so cray they just might work. I gave it a razz and you know what, with some tweaking, I think its close to awesome. You may not have pure ascorbic acid at home, otherwise known as our old mate Vitamin C, but most health food stores will have it. You need to buy the pure powder, no flavorings as you don't want Fanta flavored parmesan. That is next level nuts and we aren't there yet! The ascorbic acid gives a tang to the mix like real parmesan, which is part of the flavor bomb. Nutritional yeast gives the cheesy goodness, and if you are a vegan I am assuming you will already have this as a pantry staple. If not, pick up a bag from the health food store, its really versatile and you will be calling it your BFF and having sleepovers in no time. You also need coconut butter, different from coconut oil like peanut butter is different from peanut oil. Coconut butter is expensive to buy, but easily made from shredded coconut using a high speed blender. Toss it in, turn it on for ten minutes until it becomes a glossy goop, and hey presto, you just saved yourself a bundle. 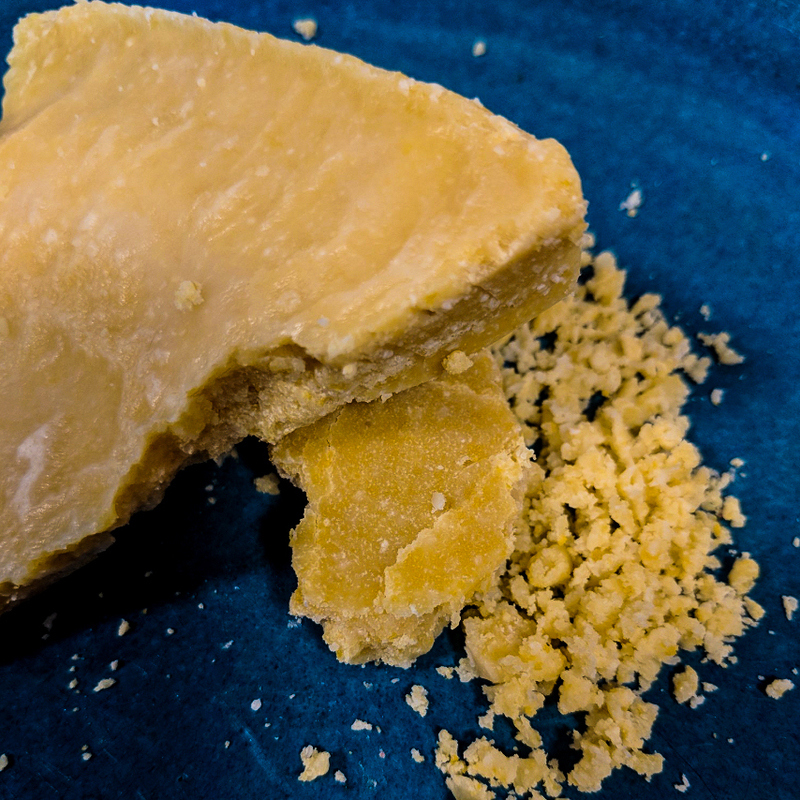 This parmesan once made goes in the fridge or freezer where it can be brought to the table with a microplane and theatrically grated on anything that stays still long enough. High speed blender for the coconut butter, regular blender for the parmesan. 1/2 cup coconut butter, if not freshly made and runny, soften it first. In a regular or high speed blender add lemon juice, coconut butter, nutritional yeast, ascorbic acid, and salt. Blend well until smooth. Add the coconut oil and blend until smooth. Pour into a freezer-safe container and freeze until solid. Grate to order like a pro!